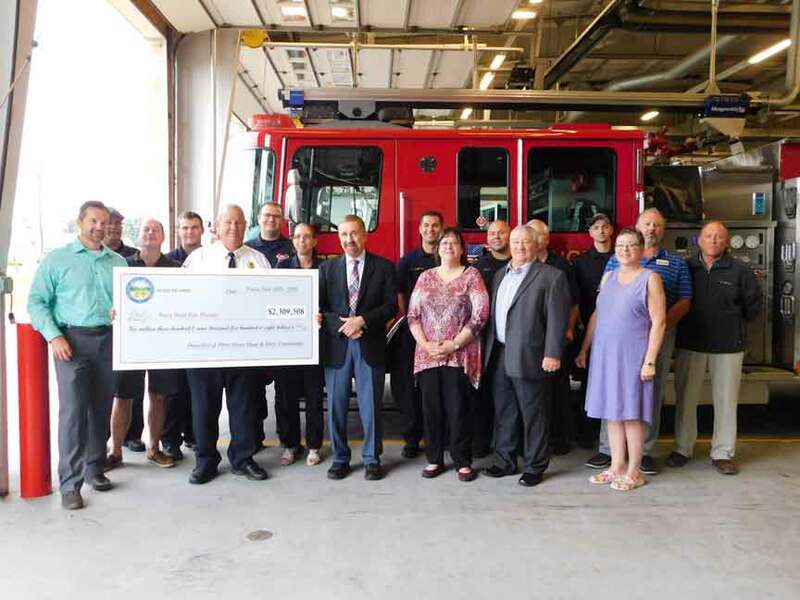 PERRY – The Perry School District and Perry Joint Fire District were the recipients of state funding with ceremonial checks presented by state Rep. Ron Young (R-Leroy Township) at Fire Station #1 on Center Road Aug. 22. The school and fire districts had funding reduced over the years due to devaluations of the FirstEnergy Perry Nuclear Power Plant, but last year took tremendous hits when there was a huge devaluation. “With the devaluation of the power plant, they lost over 30 percent of their value in one year, for instance, then they lost their personal property tax money as well, so this has taken maybe four years to unfold,” Young said. He and state Sen. John Eklund (R-Munson Township) were asked for help with the situation, he said. Their first effort was nuclear protection funding legislation which was vetoed by the governor. They made another effort on behalf of the fire and school districts which, he said, lost a great deal of funding through no fault of their own. The importance of funding for education of Perry children was stressed. The fire district funding was made possible with an amendment to legislation providing funding for Lake Erie protection, Young said, adding the school funding came from the 2017 state operating budget. With local officials and firefighters present, Young presented a ceremonial check for $2,309,508 to Fire Chief Jim McDonald, the amount which will be paid out over 10 years. He added they had come close to getting the fund twice, but both times it was vetoed by the governor. The first check for the Fire District will be, tentatively, $204,967, since it is not for a full year. In 2019, the amount will be about $276,706, with each successive year 10 percent less. The money coming from the state allowed the Fire Board to hold off on placing a fire levy on the ballot this year. “We’re going to make sure the Perry community is protected in the best manner we can do,” McDonald said. Perry Schools Superintendent Jack Thompson, along with Perry Schools CFO Lew Galante, accepted a ceremonial check in the amount of $2,268,013 which the school district will receive this year. Thompson explained the money for the school district is coming in one lump sum due to the state’s funding formula, not the legislation providing the money to the Fire District. According to state law, if a school district loses more than 10 percent of its funding due to devaluation of a power plant, the state can look to its funding formula to see if the district can be provide more funds. The current formula from the last state biennial budget allowed Perry Schools to receive about $2.3 million additional funds in 2017 and again this year. Thompson added next year’s state budget could have a different school funding formula so they do not know what to expect. Galante said the money really helps because it amounts to 10 percent of the schools’ budget. “We don’t like to lay people off; we don’t like to cut programs for kids, so we just started doing programs more efficiently,” Galante said. Perry Fire Chief Jim McDonald accepts a ceremonial check, representing the $2,309,508 to be paid out from the state over the next 10 years, from State Rep. Ron Young at Fire Station #1 Aug. 22. Joining them are Perry firefighters, staff and local officials.